Usually when a new season starts we create a thread for the next season... so here we go. The 2018 fall tornado season has been well above average for the first time since 2013. 2013 is also the latest and closest match to TNI (Trans-Nino Index, which is found to be one of the best indicators of seasonal tornado prediction) trends observed this year. That trend being moderately negative to start the year, strongly negative in the middle, and trending back down to moderately negative to end the year. However, 2013-14 was a cool-neutral ENSO event, so that is a significant difference. However, if we're to follow the TNI trend, then we can expect the TNI to continue to trend to a weaker negative value through the beginning of 2019, approaching 0 by late summer. Something that throws a wrench into the whole equation is that this Nino is expected to persist beyond when it's climatologically favored to weaken. JAMSTEC and CFS are split about what happens from spring into summer. JAMSTEC cools it to warm-neutral, CFS keeps it at weak to moderate Nino. 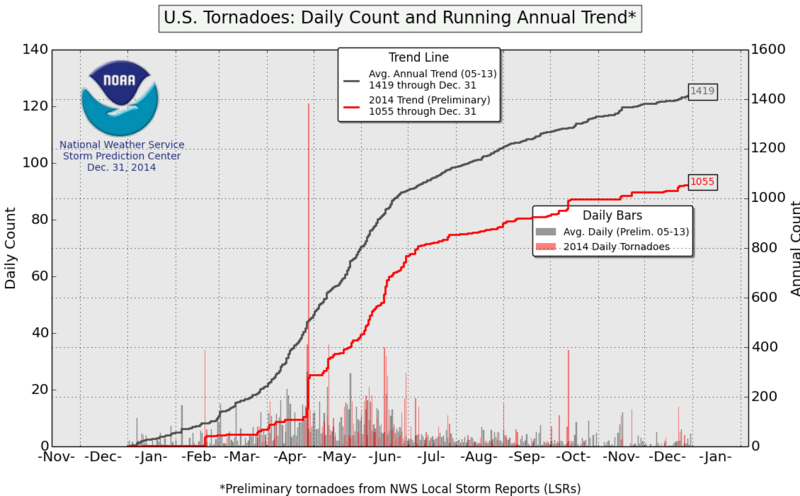 If we're to follow the TNI trend, then 2019 should have more tornadoes than 2018 just like 2014 had more than 2013. Other than that, the PDO has been hovering near neutral for a year or so. Unless the train of systems slamming the west coast stops via a persistent western ridge, I don't see that changing much. One thing I think we can count on is a strong STJ, as has been the case so far this cold season. This would favor severe weather in Texas and Dixie alley more than traditional tornado alley due to a more southern storm track. However, we have seen a significant tornado outbreak in Illinois in December which produced what's likely the strongest December tornado at or above that latitude, so there is evidence that Dixie alley won't steal the show completely. If the southern storm track can continue to be active into the spring then I can see some periodically active severe weather. JAMSTEC shows hints of a southeastern ridge. Although there's cool anomalies in the extreme southeast US, these anomalies coincide with very high precip anomalies... so it's probably just anomalies induced by wet soil. The western US, on the other hand, looks quite active and trough-y. Not what I'd expect from a Nino, but they don't always play by the rules. On the other hand, JAMSTEC can be bad at times. As of this past weekend, we are now closer to the beginning of March 2019 than to the end of September 2018. Winter weather began here in upstate NY on Nov. 9, over five weeks ago. I would not mind an early spring, to be honest. However, we have not had a colder-than-normal February since 2015, so we might have to wait until at least March for spring weather because we are due for a cold February. The number of days until astronomical spring has fallen into the double digits. While I enjoy snowstorms a great deal, I am not a big fan of frigid weather or ice. I actually enjoy every season except summer heatwaves. I do enjoy moderate summers. As a baseball fan, I must note that pitchers and catchers report to spring training in about two months. I don't know how I've never seen this but here's how ENSO phases impact tornado activity. Some very clear conclusions can be made per this research. Ninos favor highest tornado activity further north, Ninas favor further south. Makes sense because Ninos have a jet stream further north. 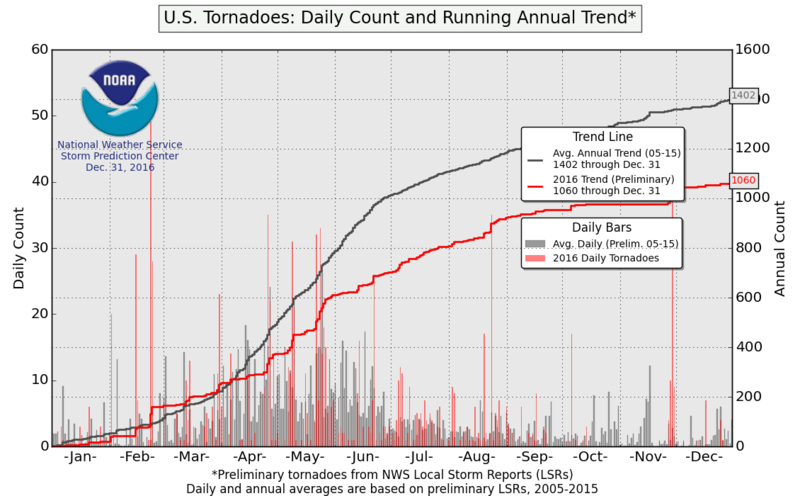 Ninos favor backloaded tornado seasons, Ninas favor frontloaded. However, Ninas appear to produce stronger/more deadly tornadoes than Ninos no matter the location. This is a moderate Nino, but how it evolves can impact this. For example, if the Nino becomes more east-based or transitions to a Nina from the west, then we may see more Nina-like characteristics. Most of the big cold systems in Mar-May that produce snow or heavy rain or hail here produce big time severe outbreaks. Apr 29, 2017 was a good outbreak right? I had snow that day. So a thought for Spring: El Nino years with big differentials in Sept & Oct precipitation tend to have big Marches in the SW for precipitation. We have not had a big March (above average) by precipitation since 2007, which coincides pretty well with the ongoing lack of tornadoes. We did have a big differential in Oct & Sept precip here in 2018, and 2009, 2014, 2015 did not feature that in Fall, they had very similar Sept-Oct precipitation. I take this as an MJO indicator for March. So I am expecting an active tornado or at least an active severe season in March, in light of the massive precipitation differences in the SW from hurricane remnant impacts scattered about through the Fall. My winter analogs have done well for December and also included some notable Spring tornado outbreaks - March 2007, April 1977, April 1954. A blend of a big positive SOI in December (maybe well into January before it flips negative again) with an active subtropical jet implies to me a big Southeast ridge at times with the subtropical jet feeding big cold storms into the West that get stuck trying to fight the heat building. That's a tornado pattern in between say, Kansas to Arkansas. I don't have Spring analogs yet, but that's kind of my high level frame work at the moment. I do think May will cool off in the East, and we'll get warm/dry fast, so May looks quiet to me for tornadoes. I also don't think an ENSO transition is imminent, you had pretty changes between Nov & Jan in the subsurface last year leading into Spring. If it turns out to be another delayed spring(plus lack of severe weather)because winter finally gets its act together in February, I will be so angry. I would just like a warmer than normal March-April combo for once. Since 2013, it seems like warm early spring periods have been extinct in the Great Lakes (Only major exceptions being mid-March 2016 and most of April 2017). Also, oddly enough, my area didn't even have its first thunderstorm until July 5th in 2018. I kid you not. I am not a huge thunderstorm fan. It just seemed really odd. Of course having thunderstorms on December 2nd was equally as unusual. Some other things for Spring. Will do Spring analogs in late Jan/early Feb.
- Low solar tends to favor cold in the Northern Plains, but only weakly. I'd show this, but the linear correlation ESRL site is down. - Actually think the NE will be warm in March. Tends to happen after big positive NAO readings in October. Correlation is weak, but the NAO was extremely positive in October. Tends to get cold in the SW, mostly Arizona, after a big positive NAO October in the following March. Nice post! Interesting stuff. It'll be interesting to see how the major SSW/split PV impacts late winter/early spring weather. It may delay the onset of the severe weather season, but as we saw in 2009-10, it can come back with rage. With 2018 over, thought I would post a little about the 'tornado drought' of the mid-2010's. 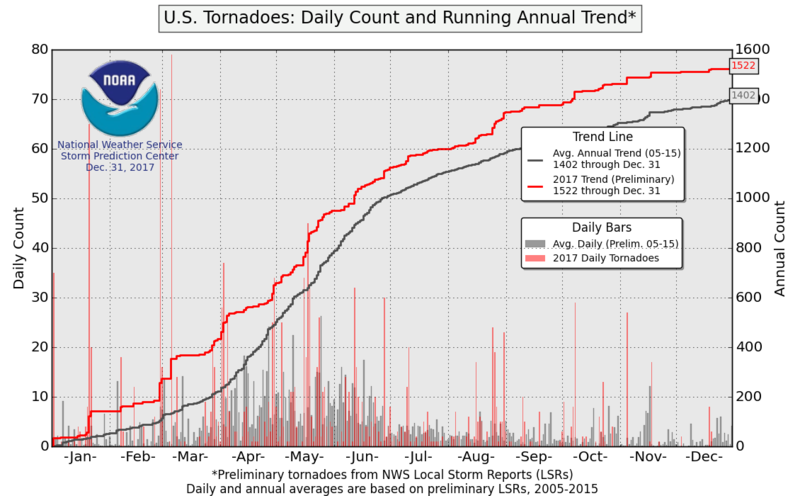 Although 2018 didn't have a violent (EF4+) tornado for the first time in modern recorded history, the year ended up being above the average during this tornado drought, though still a couple hundred below the long-term average. 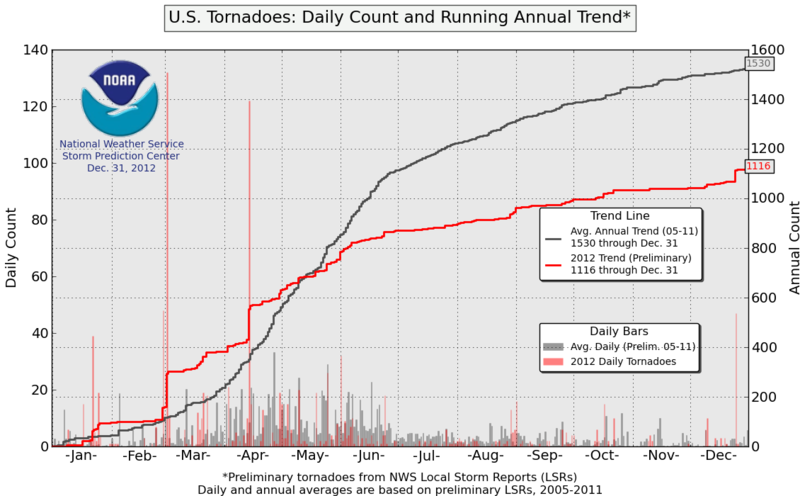 Generally, one could say the tornado drought began roughly in May 2012 after a legendary April 2010-April 2012. Unfortunately, due to the government shutdown, TNI data is inaccessible. But the TNI has been strongly negative for a large majority of the tornado drought, and the PDO has been moderate to strongly positive for this period... both factors are negatively correlated with tornadoes (TNI has the strongest correlation). The TNI actually flipped to positive for the first 3-4 months of 2017, and the PDO has been hovering around neutral for about 18 months. So, even though 2018 saw a flip back to strongly -TNI, I believe the near-neutral PDO offset it a little. As I said earlier, how this Nino evolves will be key for the activity this year. With the split PV, I fear that there's gonna be a western ridge that may make the PDO more positive this year. Another interesting thing is, just as PDO appears to be becoming a shorter oscillation, TNI appears to be becoming a longer oscillation. This would suggest more superactive tornado years like 2008-early 2012 and more dull tornado years like 2012-? Some version of this will show up in March/April I think, looks like a good tornado setup to me. There have been a few 5-10 day increments like this now since Oct/Nov. It seems to be part of the pattern. 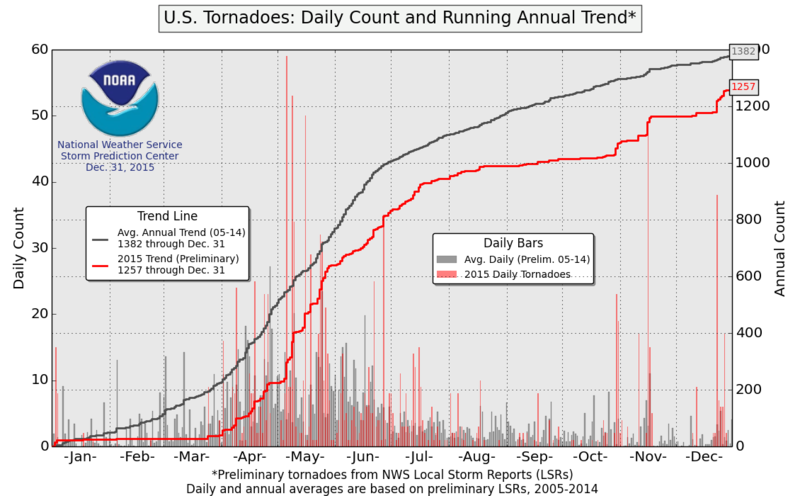 The cold season of 2013-14 had some very good setups for severe weather but 2014 was very inactive. 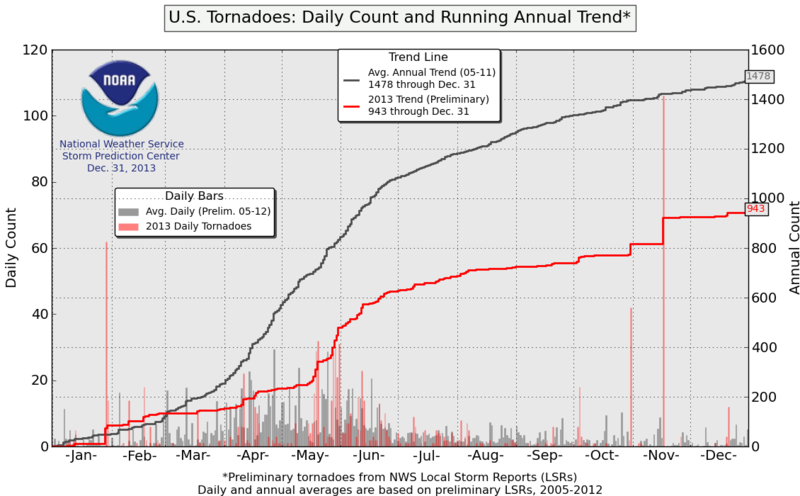 2010-11 didn't have many severe weather events, certainly none that could've hinted at the spring to come. So the relationship may be flawed. I look for cold, powerful storms in the Southwest with warmth in the SE during Spring to get severe weather. That's most common with the MJO in phase 2 at high amplitude. I don't know if it will happen, but some of the precursors are there. I don't know if we'll have a moisture laden storm in March or April where the highs are 25-30F below average during the day like today, but that's the type of low that would do it, if you get the associated dry line/cold front v. warm/wet dynamics I think. There is research that says even though the MJO in phase two most typically favors violent tornadoes, the number of tornado outbreak days (frequency) varies more by MJO status for what month it is. The MJO entered phase 2 on 10/8, 11/2, and 12/2. It's been stuck in 5 for a while, so it's hard to say if it will get to two at high amplitude in March for now. Violent tornado outbreaks are infrequent weather events whose likelihood is modulated by low-frequency, seasonal, and intraseasonal background states. Despite the inherent complications of and uncertainty resulting from comparing the MJO with VTDs (Violent Tornado Days), a statistically significant signal has emerged. The MJO shows robust association with VTDs throughout the year, but especially during MAM when VTDs are most frequent. Results show that VTDs account for 9.3% of all days in phase 2 with RMM amplitude >1.0 during MAM. This proportion is more than twice that of VTDs occurring during any other phase or when the MJO was deemed inactive. A similar analysis of NTOs suggests that the association between VTDs and the MJO is not simply a function of some broader relationship between the MJO and severe weather in general, but is specific to VTDs. VTDs during phase 8 are significantly less frequent than climatology, and VTDs during all other phases are not significantly different from climatology. Yeah, I followed the MJO through 2017 and 2018 because of that research. The first event that sparked my interest because of the MJO was February 28, 2017. There've been other events that coincided with MJO phase 2 but I can't remember which ones and now I can't look back because Accuweather forum is dead. So, yeah, it could be a good sign that the MJO has been active... but ENSO impacts the MJO's activity and we're getting to the point of the year where the ENSO evolves. If CFS is right that the Nino isn't gonna change much through the spring and stay at moderate strength, that'd be an interesting scenario. BOM has archived MJO data if you ever want to look at tornado linkage to the MJO from 1975 on. The current MJO wave has been a bit like a blend of 1997 & 2007, the blend of the Super Nino with a strong Nina gets you a weak Nino, basin wide, with similar MJO timing, similar magnitude with relatively low solar and the AMO/PDO are decent matches too. I always include MJO analogs in my winter and spring outlooks using their stuff, it is too difficult to get the timing of changes right without incorporating it. Emerging area of cooler water showing up in the subsurface below the eastern ENSO regions. There was some pretty rapid upwelling through December... probably related to the +SOI. If this continues, then we may be seeing the start of a Nina. The meaning for spring? The atmosphere is already responding to a neutral ENSO... if we can get the basin to cool, maybe it will begin responding to an even cooler event, like a Nina. But this is under the assumption that the conditions we've seen over the past 40 days will continue going forward, which isn't guaranteed. Regardless, something to keep an eye on. This is what CPC has for March-May as of 12/20.The map for precip looks pretty good for me, but I'd expect temps to change depending on what the El Nino does. Some strong signals locally for a wet April here. I'm pretty sure there are two-three big-time blizzards in this pattern during Spring for the Northern Plains and the Southwest. Not sure where exactly. First week of March and mid April are my current bets for timing. This isn't a forecast though, just speculation. Need to see the Nino 3.4 data for December and January first. Winter has looked like 1991-92 so far nationally, but the look of that Spring looks "off" to me. For whatever reason, extreme cold in the West will often come between 2/15 and 4/15 in years following a hit on the Gulf Coast by a major hurricane in the previous fall. I'm expecting March to look like some kind of blend of March 1942, 1958, 1966, 1970, 2005, the El Nino Marches following Audrey, Betsy, Camille, Ivan, and the Texas Hurricane of 1941. You'll notice the years have pretty substantial heat or cold relative to averages, sometimes both. 1966 is warm in the Plains, but keep in mind, it got severely cold before March in that year, which seems unlikely near-term, given the 6-10 and 8-14 CPC outlooks and the persistence of the heat in the Northern Plains since 12/1. A blend of March 1942, 1970, 2005 seems about right for March, but I do need to see the Dec/Jan data first. I'll put my Spring analogs/forecast up once I have it finalized in early February. First tornado of the year goes to northeast Ohio. Didn't get a radar shot because I wasn't expecting it. (Edit: confirmed EF1) I could definitely see this pattern producing severe weather in April or May. October offers a lot of hints about March here. Looking back at wet Marches, the storm timing of October 1998 is the top match. MJO was briefly in phase 8 in early January 1999, like this year, although from a different origin. In El Nino years, highs here can be replicated relatively easily by finding a blend of a solar, Nino 3.4, and prior year Nino 3.4 where actual highs match the solar, ENSO, and ENSO prior blend. For temperatures this blend has been doing extremely well locally for close to four months now, and it has a cold March in the Southwest. Will be curious to see if this "breaks" in January or February. Based on the trends in the subsurface, a Nina is imminent either this coming winter or next. The cold temps rising in the eastern basin is one hint; if we can get some more enhanced trades/+SOI in the future (we've entered a period of slightly -SOI, which implies weakened equatorial trade winds), then we'll see this cold tongue hit the surface and start to spread west. Another hint is the weakening of the 150-200m warm waters. As it stands now though, I think a Nino or warm-neutral ENSO is going to exist through the spring and at least early summer. Even if we start seeing a Nina develop this spring, it wouldn't necessarily be favorable for severe weather because it's starting in the east and spreading west, and we'll be in a sort of west-based Nino/east-based Nina configuration... which isn't good. But in that case, it's kind of an investment for next year because that would mean at least a cold-neutral ENSO for next winter and spring... which, obviously, would be exciting. The forecasted cold spell caused by the SSW/PV split later this month makes me nervous because we're starting to get close to Meteorological spring. Hopefully we can get back to the raging Pacific jet soon because that'll break the cold pattern of late January and return us to the relatively active severe weather pattern. The last time we had a raging Pacific jet through the winter and early spring was Dec 2016-Mar 2017, which was incredibly active. I'm expecting the progression into Spring (March) to gradually move the core of the cold from the East, to the Midwest, then to the Rockies, then into California by April, roughly in three week segments. Each time there is a transition, there should be some kind of pattern altering storm moving through the West that will have the potential to bring tornadic activity. The MJO is set to emerge in the warm phases, 4-5-6 for the East at fairly high magnitude in a few days, which should help control some of the cold. The move through phase five looks to be much lower magnitude than in December though. Given that the winter has been fairly dominated by MJO phase five so far (look at the phase 5 image above and the map below), I think it's fairly likely the MJO gets stuck in one of the phases at high amplitude again in Spring. 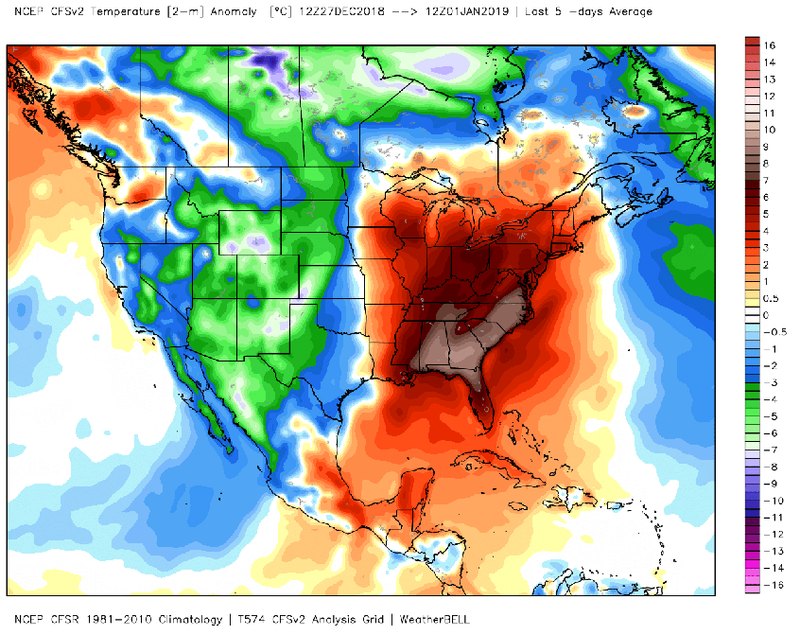 The Jamstec update for Spring now has a cold Eastern US, with the West wet. It did do fairly well last year. My current analog weighting has something similar to the new Spring outlook, but the cold is in the West/Plains in March before kicking east in April and May. I like the talk of a neutral / Nina event for next winter, rather than the talk of a strong Nino. JAMSTEC did pretty well last year, wow. Interesting that you're going with what sounds like a front-loaded spring. Not saying that's wrong or bad, just not what I'd expect after a moderate Nino. Especially one in which the Strato PV split. Since I made that post on the 15th, the SOI has been positive... going on the 5th day in a row now. We'll see how much longer that lasts.. but JAMSTEC does also like the idea of a neutral ENSO next winter, trending toward Nina by spring. The January update cools the SSTs earlier and quicker than the December update. Anyway, that's a discussion for next year. Definitely gonna continue watching the SOI. Previously the models were showing that this Nino may last through the year... JAMSTEC has now backed off that while CFS has doubled down on it. The implications this has is CFS sees continued WWBs (implies -SOI), while JAMSTEC sees stronger trade winds (implies +SOI). I'm still playing around with my analogs, I'll link to my physical forecast with maps and all the ideas in a few weeks when it is done. My forecasting method involves getting analogs two seasons before the new "season", and then seeing how the first month works based on the analogs before releasing the outlook. If the first month has an unexpected feature, I make changes as necessary. My winter analogs were from Sept, but I switched out 1934 for 1953 in October when Sept/Oct went differently than expected. It's currently hard to tell how everything washes out with the ESRL blending down. So even though I'm not expecting my analogs to change much, I'm not sure what I'm saying here is exactly representative of the blend I like because I can't "see it" visually yet without the analog blends mapped. That's why I'm being vague. The Jamstec flip is essentially from Spring 1977, which has been my 2nd or 3rd best monthly Tmax match in the last 100 years for July-Dec to Spring 2005, which is a top Precip match here for July-Dec. I can't show it with the ESRL site down, but I'm pretty sure there are strong correlations in the Plains in March to solar conditions, but I can't remember exactly where and how strong. The East tends to be mild/warm in March in low-solar El Ninos. The +SOI in Dec and very +NAO in Oct weakly favor Eastern warmth in March. As a blend, I think that gets you to a warmer than average East Coast. I'm actually pretty high on 1974-75 as an analog. It was a La Nina, but it had a +SOI in Dec and then a -SOI in Jan, and it has one of the top y/y warm ups in Nino 3.4 since 1973-74 was a much stronger La Nina. It's a good match nationally for temps in winter too. Low solar. Major hurricane hit the Gulf of Mexico. It was also warmer in Nino 1.2 than Nino 3.4 late in the event, like January 2019. What I was talking about with the disagreement between CFS and JAMSTEC. I'd put money on JAMSTEC because CFS loves seeing Ninos. Also pretty funny/interesting to note that the two models even disagree on initialization by 0.5C. The model showing the stronger ENSO on initialization is the one showing the ENSO switch. Ironic. March 7, March 24, April 11 show up as big days in almost all of the years. I find that this method generally works pretty well, give or take two days if 75% or more of the analogs have a day with a storm. In Spring, any storm that can bring 0.1" or more here tends to be either a) very wet or b) very strong. So those would be my tentative tornado time frames to watch in the Plains. I'm leaning toward three storms in March, two in April, and one in May for the city. An average Spring here will have five days with 0.1" precipitation or more, so six is consistent with my other methods showing a wet/cold Spring here. 4) Top match (instead of re-creating July-Dec rainfall patterns, you just find the ten closest matches by absolute values and roll forward the best match average). Last year, the replication method was astonishingly accurate, it had 0.31" precipitation here in Spring which is some Dustbowl level BS, and we had 0.30". The other methods were all correctly below average too. 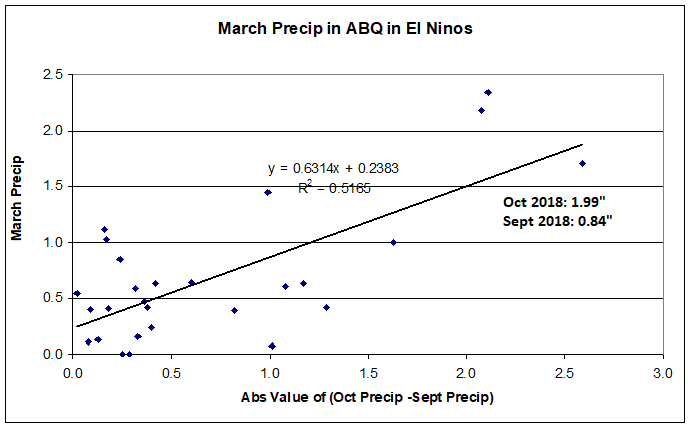 This year, the four methods are clustered between 1.6" and 2.1" for Albuquerque, 0-30% above average. I generally consider the replication method to be an MJO magnitude and timing indicator, as it is nearly impossible to replicate July-Dec closely each year, even with 100 years of data available to blend. The others have skill but appear to be more specific to this area with little application outside the region.